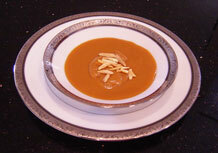 Doodh Basanti is similar to the South American dessert called Dulce de Leche. It’s made from milk and sugar and after returning home to California, we’ve made it many times. We call it Doodh Basanti, after a somewhat similar Indian sweet called Basundi. 1) Pour the milk in a thick bottomed pan., add 1 and a half cup sugar, an 1/8th tsp of salt, 1 tsp baking powder and stir until all of the solids dissolve. 2) Turn on the heat, and then turn down the heat as the milk starts to boil. Stir slowly and constantly to make sure that the milk doesn’t burn at the bottom. In Bengali the burning of the milk is called “doodh dhore jaoa.” Continue heating and stirring and keeping eye on the milk so it doesn’t spill over. This will take about one hour, so patience is required! The milk will slowly caramelize. 3) Continue this process to bring the milk to a thick consistency and a deep brown color, then turn off the heat. 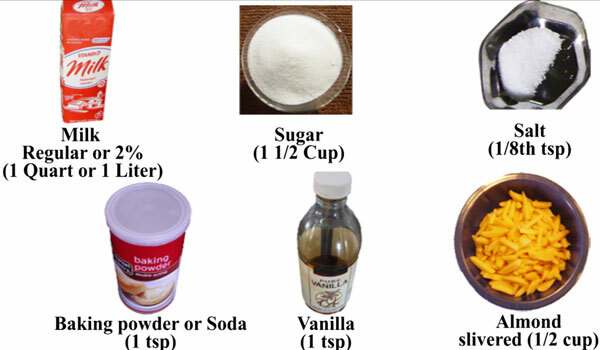 4) Add 1 tsp of vanilla extract, and then set it aside to cool down. 5) To prepare the walnuts, roast walnuts on a skillet until they turn a little brown. Turn off the heat but continue stirring, and the walnuts will be fully roasted in the remaining heat. 6) Sprinkle the roasted walnut on the cooled Doodh Basanti and enjoy! Doodh Basanti can be stored in a refrigerator for up to two weeks.